How do I create an account-level Grading Scheme? 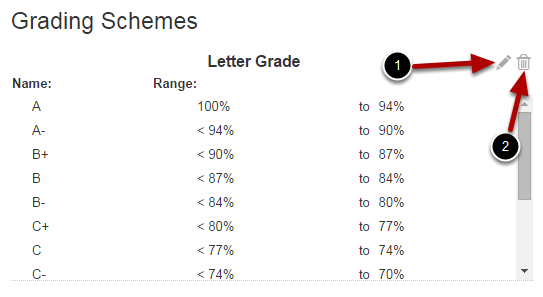 On the account level, you can create grading schemes for your entire institution. View examples of common grading schemes. Note: Any grading schemes you create on the account level will also display within sub-accounts. Click the Add Grading Scheme button. Create a title in the Scheme Name field . For each line item, edit the grading scheme name in the name field . Edit the minimum end of each individual range in the To [Number] % field . 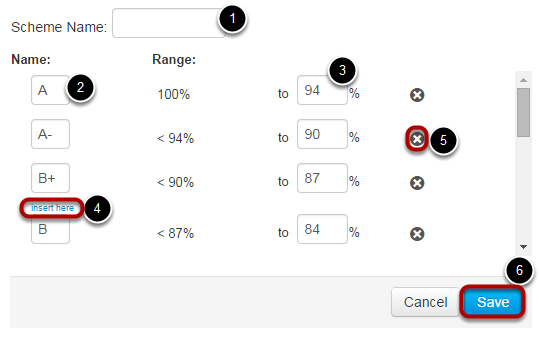 If you need to add ranges, place your cursor over a range checkbox and click the Insert Here link  when it appears. You can remove individual ranges by clicking the remove icon . When you are finished editing your grading scheme, click the Save button . Your new grading scheme will appear underneath any previously used grading schemes. You can always edit the grading scheme by clicking the Edit icon  or delete the grading scheme by clicking the Trash icon .